The director of The Dark Knight wants to reuse footage of Heath Ledger in the next Batman film, even though he died in 2008. Christopher Nolan did a great job bridging his first reboot Batman film, Batman Begins, with the second film, The Dark Knight, by showing the villain Scarecrow being captured early on in the sequel. Hollywood sources report that Nolan might want to do the same thing with his third film, The Dark Knight Rises, by briefly showing the Joker, perhaps incarcerated in Arkham Asylum. The only problem is that Heath Ledger, who played the Joker in The Dark Knight, tragically died from a drug overdose in 2008 before that film was even released. 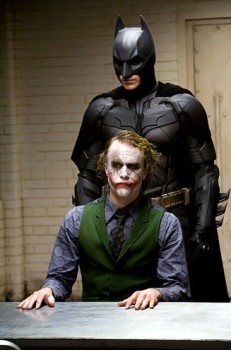 Nolan might get over that little challenge by a liberal use of CGI on existing footage of Ledger as the Joker. "The idea is to use these fragments of cut scenes and use CGI to have The Joker appear one last time," said a source close to the director. "Chris wants some continuity between movies and for the franchise to pay tribute to Heath and his portrayal of the Joker." Luckily, Nolan wants to make sure that using Ledger's likeness wouldn't offend anyone, especially the actor's family. "It would only be a fleeting moment in the movie and would only be included with the full consent of Heath's family." I honestly think that it's a wonderful idea, as long as it's handled well. As little as ten years ago, I could totally tell that Oliver Reed's character in Gladiator was faked in the one scene that needed to be filmed after the actor had passed away. But film technology creeps ever forward, and it's possible that a short cameo appearance by a deceased Ledger will not be as obviously doctored. It would certainly be a great tribute to a brilliant performance by Ledger, not to mention his whole career.